The State of Texas marker that was placed at the supposed site of Cincinnati in 1936. 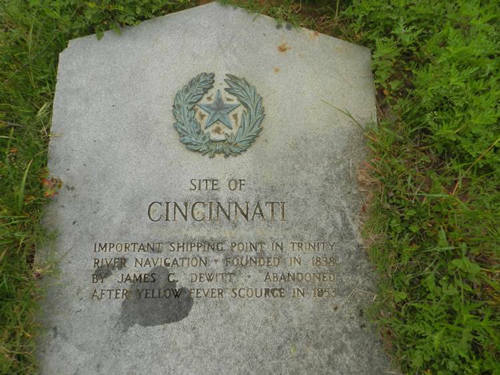 The founding year on the marker is incorrect and the marker itself plays into the local myth that Cincinnati ceased to exist after the yellow fever that hit is in 1853. The engraving reads: "Important shipping point in Trinity River navigation. Founded in 1838 by James C. DeWitt. Abandoned after yellow fever scourge in 1853."